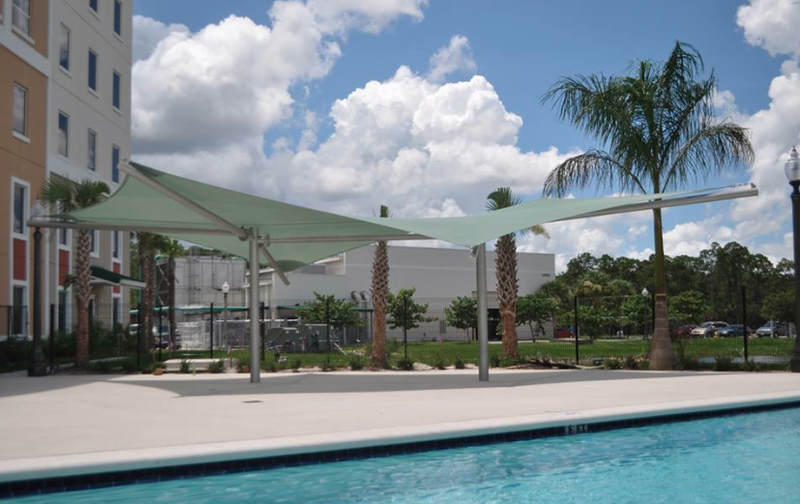 Our Shade Structures are made with HDPE (High Density Polyethylene) Fabric with ultraviolet additives. It Is Rachel knitted so it will not unravel when cut, ensuring stability and a consistent shade pattern. The shade fabric cloth is known for its strength, vibrant color and durability. See color chart for available colors. 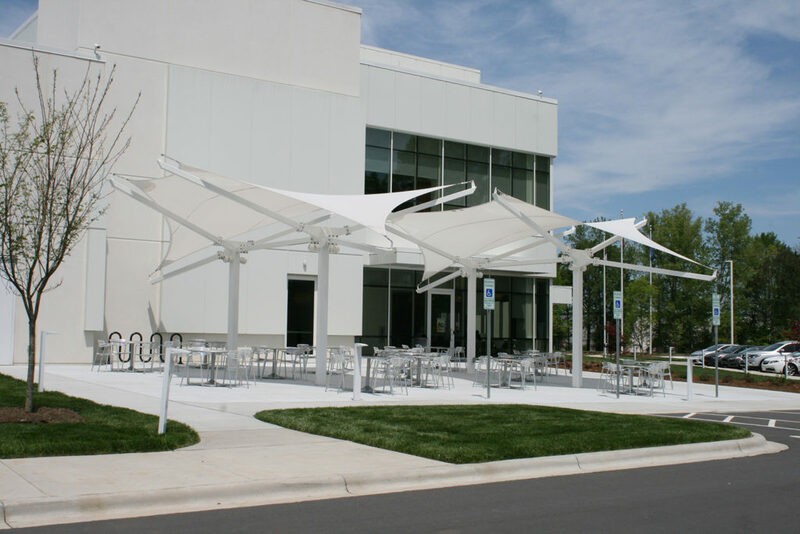 Provide shade while also adding an architectural structure element. Three point shade sails and four point shade sails are available and can be designed to meet your needs. Shade sails can be designed in a variety of heights. 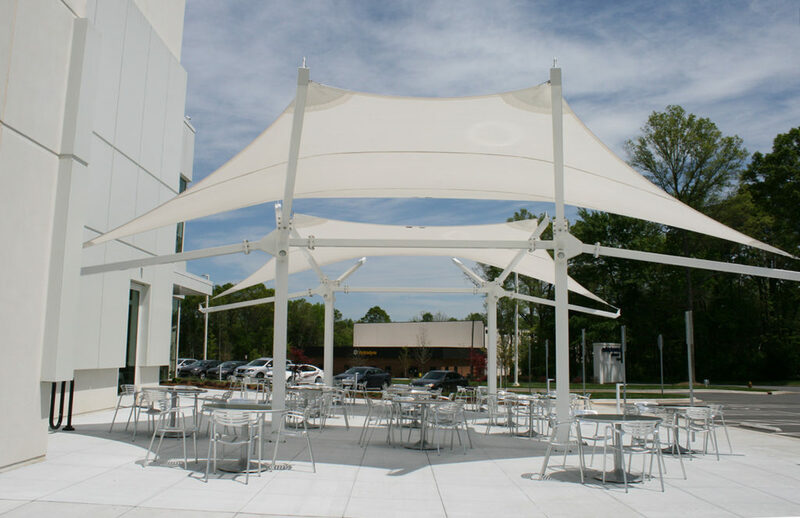 These fabric structures are pre-engineered shade canopies and come in a variety of sizes and heights. The shade canopies are great for Playgrounds, Bleacher Covers, Seating Areas, Work Stations, Aquatic Parks and more. Cantilever Models offer the perfect shade solution for minimum obstacles and maximum sun protection. 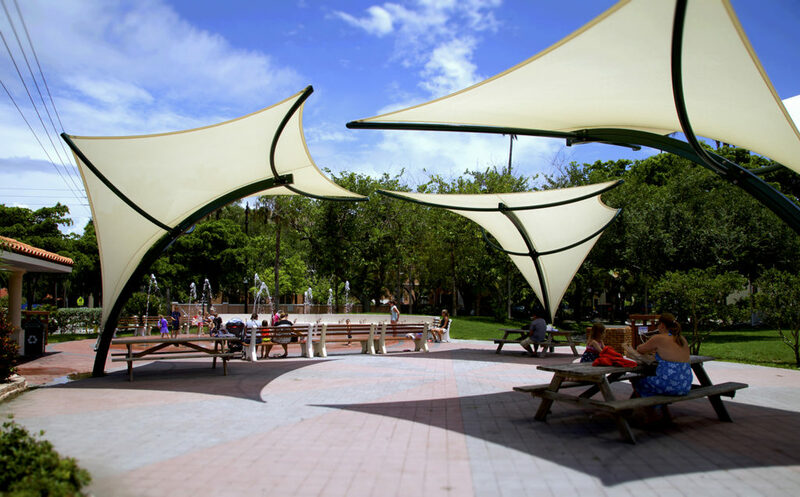 These shade structures use breathable HDPE fabric that are 80% water repellent and can lower temperatures under the fabric structure by 20 degrees while blocking UV radiation by up to 97%. Engineered for 170 mph winds (120 mph with cover on) and 5lbs snow load. The Modular design can be interconnected to form infinite lengths of continuous shade. The steel architectural structure frame is available in a powder coated finish. 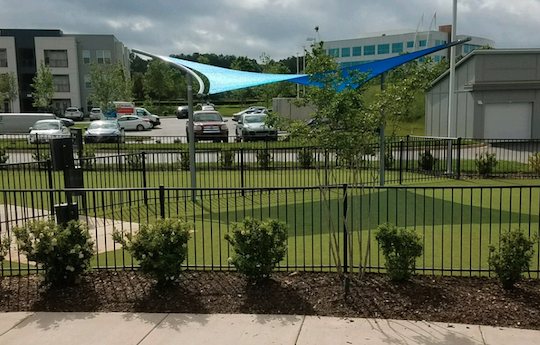 These durable permanent shade structures have a fixed center steel column that eliminates unnecessary perimeter posts that can be an obstacle. The sun protection umbrellas are ideal for playgrounds, sandboxes, outdoor dining and seating areas, aquatic/pool areas, picnic areas and more. They are available in a 6 sided hexagon design and a 4 sided square design. Sizes range from 10’ diameter to 20’ diameter. Playing on a playground shaded with PlayTowers is similar to playing under a shade tree – the breathable fabric canopies lower the temperature underneath by 20 degrees while blocking up to 97% of cancer-causing ultraviolet radiation. Utilizing existing playground equipment columns, PlayTowers integrate with the equipment – offering safe, obstacle-free shade directly over the heart of the playground. Large playgrounds can be covered with continuous shade by designing effectively with multiple overlapping PlayTowers. PlayTowers outdoor canopies are engineered for winds up to 170 mph(120mph with covers on) and 5 lbs snow load. They can also be engineered to meet local code demands. Quick and Easy cover removal – NO special tools to remove our outdoor canopies – just loosen the turnbuckles!